Well, even if the skinny jeans are still on top, a new cut of jeans is the hot silhouette right now... 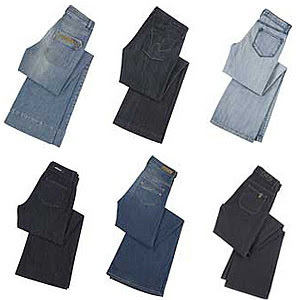 Yes, of course, i am talking about the wide-leg jeans, the hottest new shape for this fall. 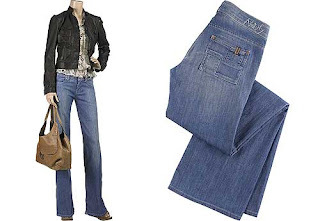 They are the must-have pants for the moment, and according to stylists they are very versatile. Although i saw some really nice, chic outfits including this kind of jeans, i can't resist thinking that they really are not for every figure, but reserved for those lucky tall and thin among us. What kind of wide-leg jeans i prefer? Well, the combination high-waist + wide-leg, for my type of silhouette, is simply deadly - it will kill every inch of good looks in me! So definitely low-medium waist for me. And then colors: already, every respectable shop features a wide variety, so don't be afraid, you will find wide-leg jeans in every color you might like. I for myself prefer distress, vintage blue jeans, so i will probably (if i will ever find a pair to like and that fits well) buy in such a color. I really like this vintage blue washed color for wide-leg style of jeans. Somehow i don't see myself in any other color of wide-leg jeans (that's it if i can see my self in such a jeans cut). I would wear them mostly with grayish and brownish colors. Or maybe with an white shirt... I really must try a pair, to see for myself how they fit! How about you? Do you fancy this style?